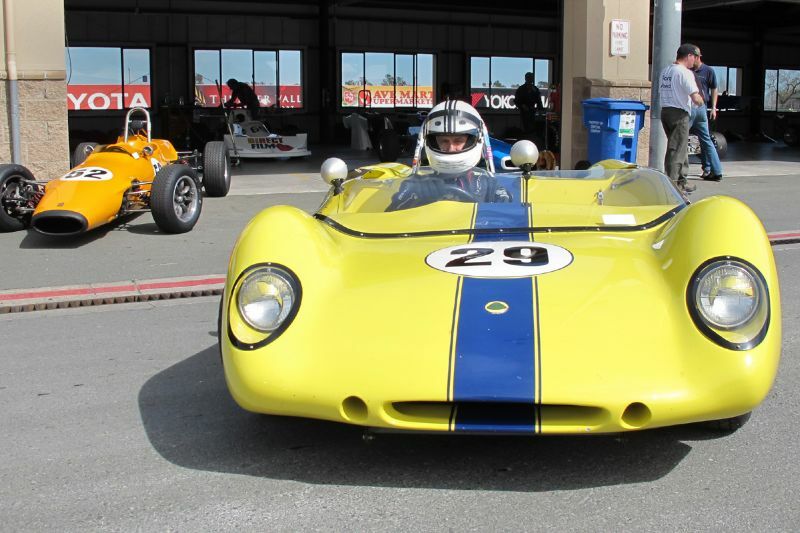 To begin, I was driving through the Sonoma Valley early Friday morning on April Fools’ Day—I’m not kidding—to spend the next three mornings and afternoons doing what so many of us love to do, which is to attend a vintage racing weekend at one of America’s best road course raceways. The surrounding hills were green from recent downpours, hawks were high on the wing, and vineyards were coming back to leaf once again. What really could be better? Well, maybe the sight of cars on track and the song they make, up through the gears, around the corners, flying along the straights in chase of something that defies description. 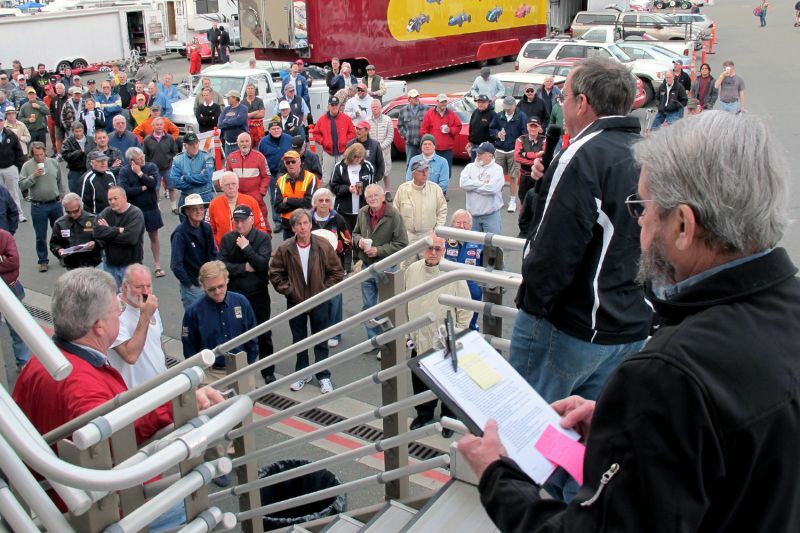 As a companion story to Dennis Gray’s event report, I picked three owner/drivers with dissimilar cars and stuck with them all through the California Sports Racing Group (CSRG) season opener, April 1-2-3, at Infineon Raceway, the 2.52-mile, 12-turn challengingly technical road course in northern California’s Sonoma County where the local Zin, Cab and Pinot wines are inspiring, and racing equally so. 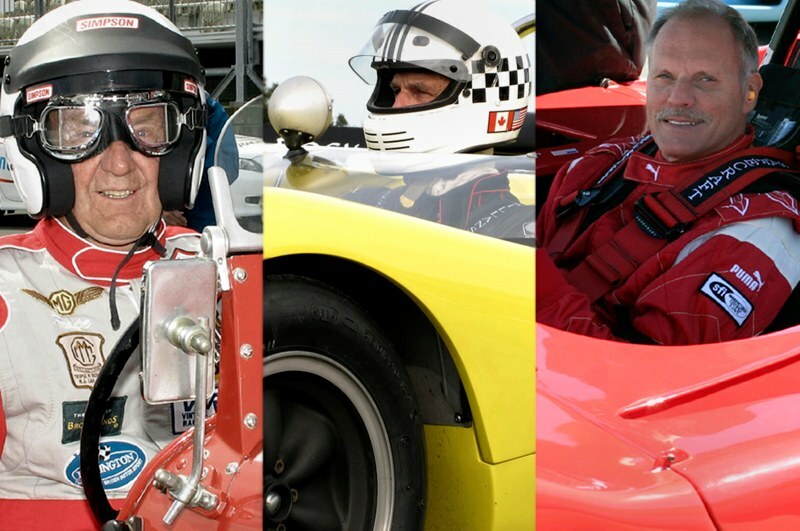 My idea was to see what these three gentlemen do in getting themselves and their cars ready and into another year full of vintage racing. Here’s how it went. 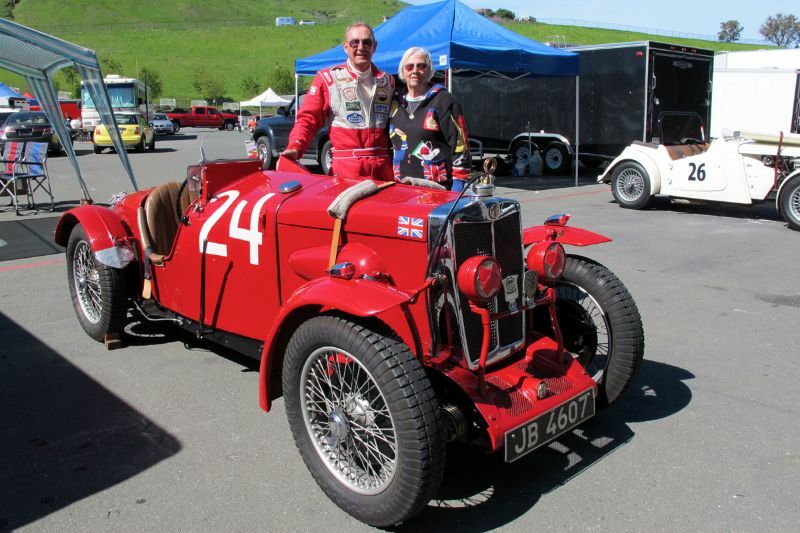 Oldest first, in both man and machine years, was Pete Thelander and his 1934 MG NE Magnette, brought back this year to the track sporting a fresh 1316cc engine rebuild with 58mm pop-up pistons replacing the old flat-tops to increase horsepower from its previous 55-hp to a much improved 75-hp. So this early spring race date would be a serious shakedown for Pete and his newly fitted power. Originally MG factory-built and suited in Italian red—not traditional BRG—for Tazio Nuvolari, the car was to be in The Great One’s hands for the 1934 Ulster Tourist Trophy, but a last minute sponsorship pickle botched the deal and substitute Bill Everitt drove the 56-hp, 1086cc, 6-cylinder MG, doing quite well with the task until a rear wheel broke. With Nuvolari out, and Everitt’s DNF, the factory’s earlier hope for international glory with the car was lost. “The car then knocked around England until after the war,” Pete told me. In 1955 it came to America and wound up with legendary NorCal MG distributor Kjell Qvale. Pete later acquired the nomadic MG NE in 1972, restored it, and gave it a permanent home. 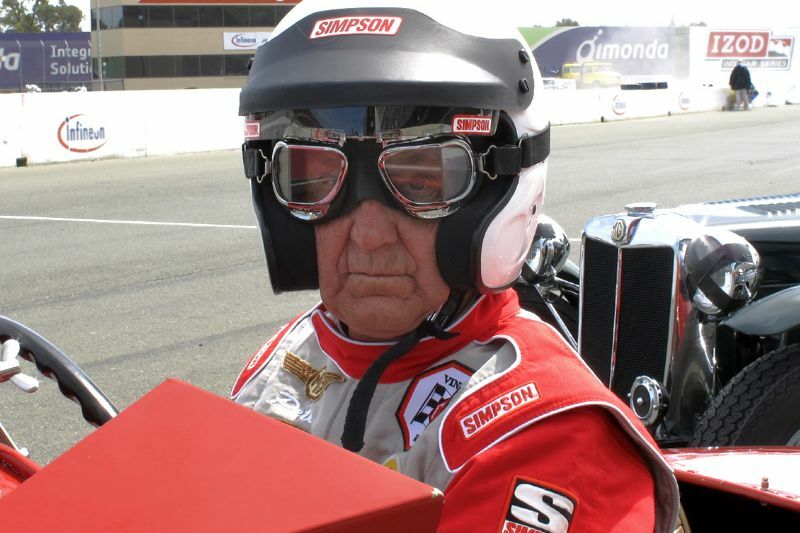 He’s now been racing and showing it for the past 20 years. Generally speaking, Pete Thelander is a happy chappy—but for my picture here he wore his race face. We’ll come back to Pete later as the 3-day CSRG weekend mounts. 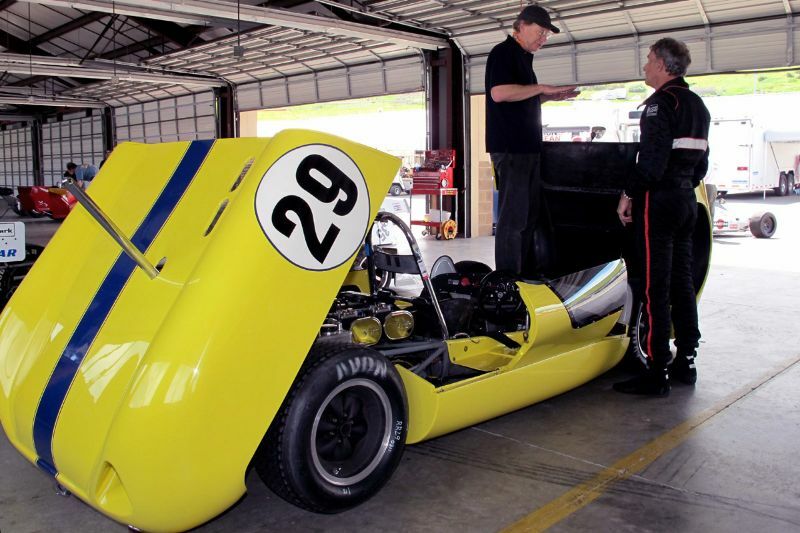 Meanwhile, I hooked up with long acquaintance Carl Moore and his 1963 Lotus 23B Twin-Cam. 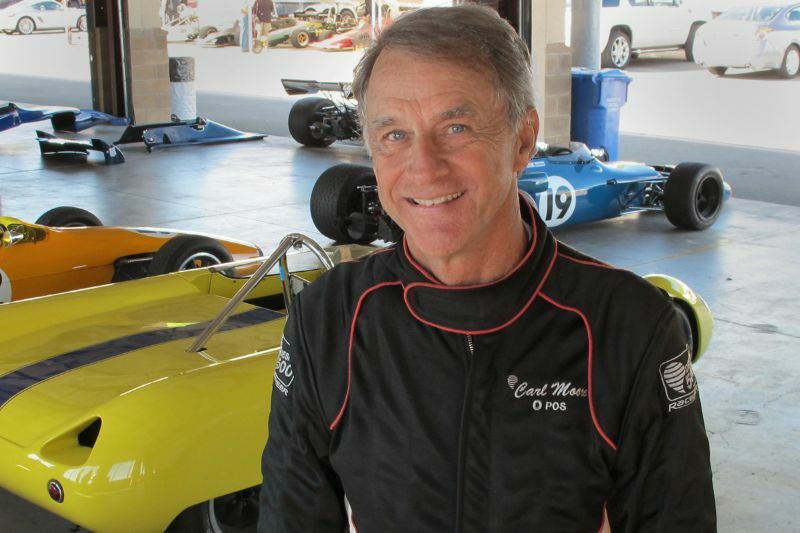 Carl, who’s been vintage racing for 31 years, owns and drives much larger cars than his yellow Lotus, meaning big mean stuff like a Can-Am McLaren and Birdcage Maserati. 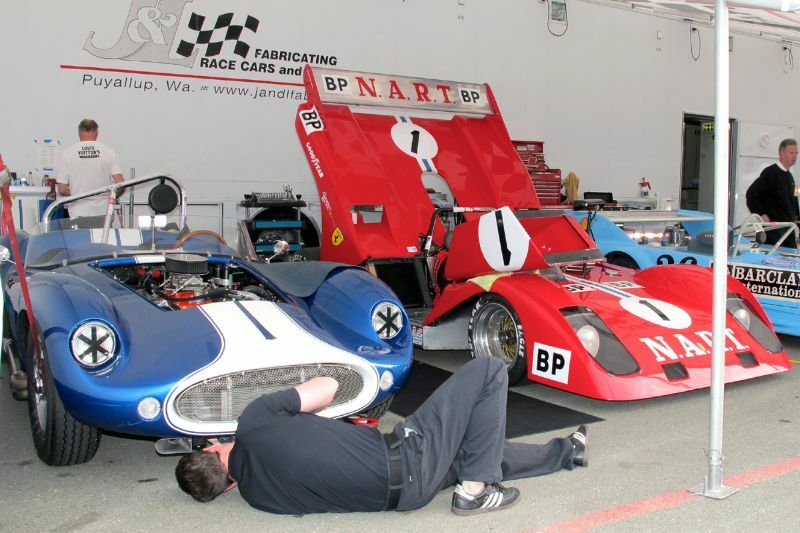 Both of those cars are entered in early June’s Sonoma Historic Motorsports Festival that will also take place at Infineon Raceway. Nonetheless, Pete is sweet on his little Lotus, and it’s a very cool track tool. “This Twin-Cam has been around northern California for 25 years” Carl said to me Friday morning at the track garage where he was prepping the car. “I did a lot of work on suspension. It was set up by someone who was probably a former Go-Kart racer, and it was called a ‘flat slider’. It would turn quickly, but break loose quickly, also. I didn’t like that at all.” So Carl made some suspension setting tweaks, calming the Lotus down a bit to behave more to his liking. 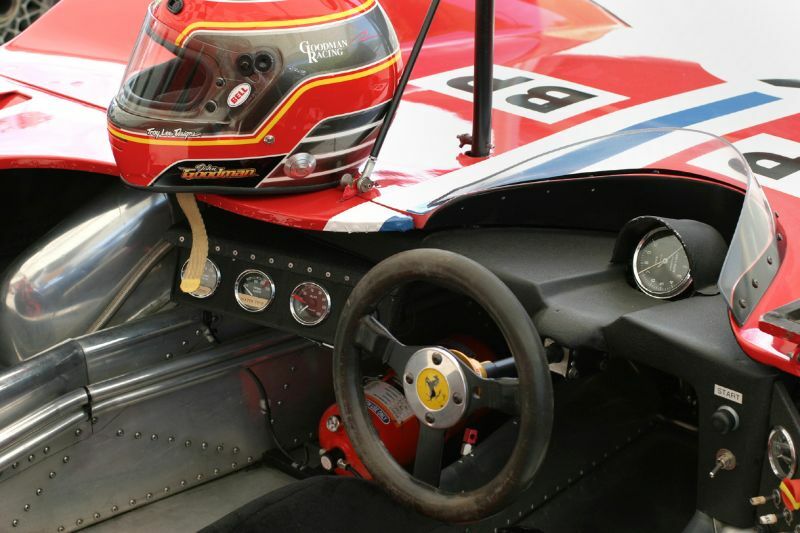 Carl was supposed to have a second car to drive here this weekend—his 1976 March 76B. “I put a piston outside the block at the last race last year,” he’d told me of the March, “so we had a whole new motor built. But then in tests it was making some ‘inappropriate noises’ and the engine builder took it down and found some things that were not right, and he’s now making it right.” As we all know, there’s a big advantage in owning more than one race car, especially with the vagaries of vintage racing. Our third driver-and-car subject at this CSRG opener came in from Seattle, where he owns and nurtures a large stable of cars. John Goodman brought two of his hot ones here in the immense J&L Fabricating transporter out of Louie Shefchik’s race cars and restoration shop in Puyallup, Washington. 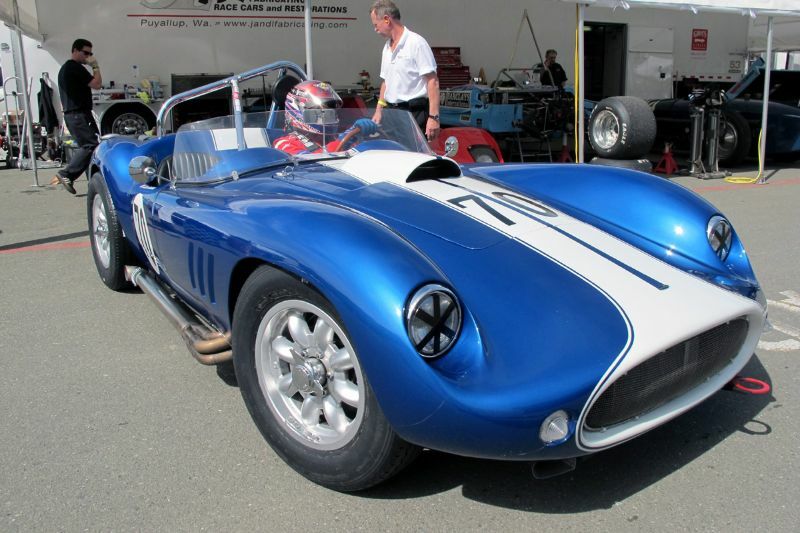 John’s blue 1958 Devin SS, along with his red 1972 Sparling-Ferrari Special (Wayne Sparling had a hand in it some years ago) based on the Scuderia’s championship 312 PB cars, make a striking duo of dynamite vintage muscle. I was bowled over back in the day at first sight of a Devin SS. Lance Reventlow had just brought out his sculpted Scarab sports car, and Carroll Shelby’s burly Cobra had not yet made the scene, so in 1958 the SS fit quite nicely between those two styling and racing icons. The car was the brainchild of Oklahoma-born Bill Devin who married an Irish-built tube chassis with a Detroit Corvette engine and California fiberglass body. They were stunners, those Devins, then and now. John Goodman digs his for it’s small block brawn and beauty of contours. Going back into the car’s past, Bill Devin at its inception named Art Evans his sole Devin distributor and, with that in mind, I asked my old friend and fellow historian about it. “I sold all of them,” Art said of the way too-few Devins built. 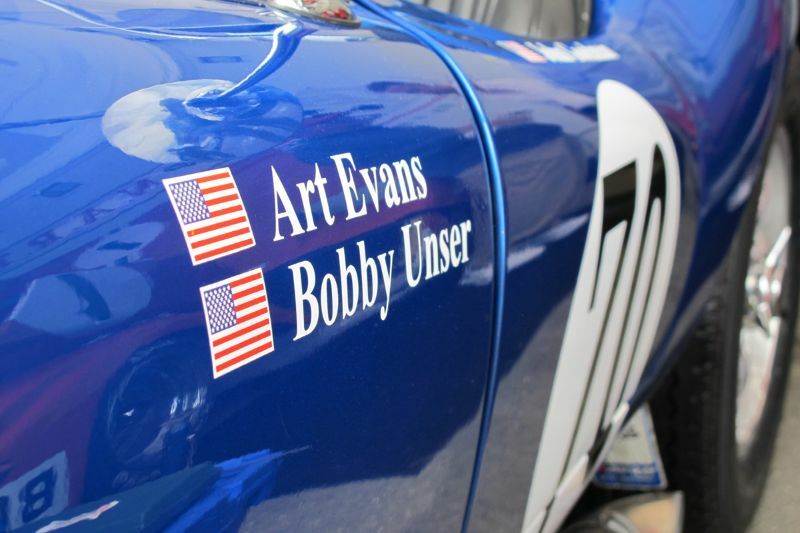 “This one [John Goodman’s] originally went to a doctor in Orange County in 1958, then later spent a few years in a farmer’s barn before I bought it.” Bobby Unser had driven this same car in a pro race at Tacoma in the late 1980s, and Evans raced it as well, along with its other drivers of note being Andy Porterfield, Pete Woods and Jay Chamberlain. 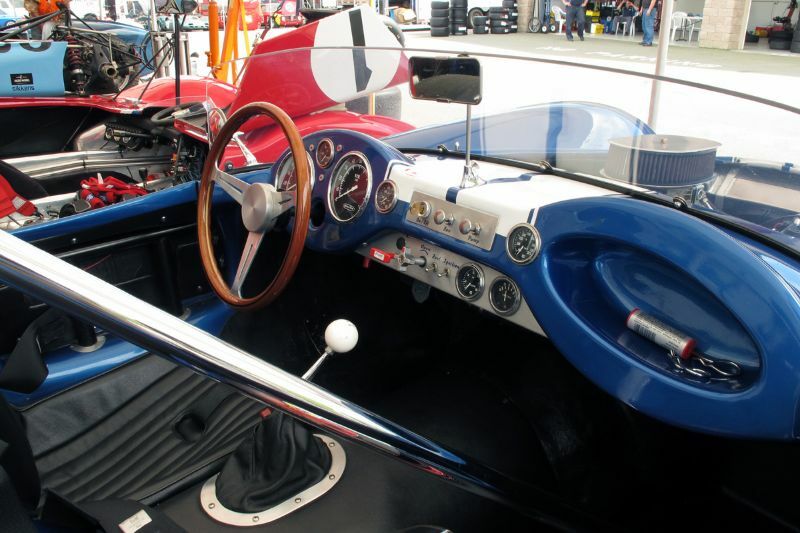 Evans eventually sold the car to vintage racer Tom Hollfelder, from whom John bought it about three years ago. John’s other car at the CSRG Opener was the Ferrari he’s owned for about ten years and is familiar to all in our vintage racing world as a stunning on-track attraction. The 3-liter SOHC V12 breathes through mechanical pump Lucas slide throttle injection, stops on disc brakes—regular front, inboard rear—and delivers 400 bhp and 350 lb.-ft. spun through a Hewland 5-speed gearbox to rear 15×14-inch BBS wheels shod with Goodyear slicks. 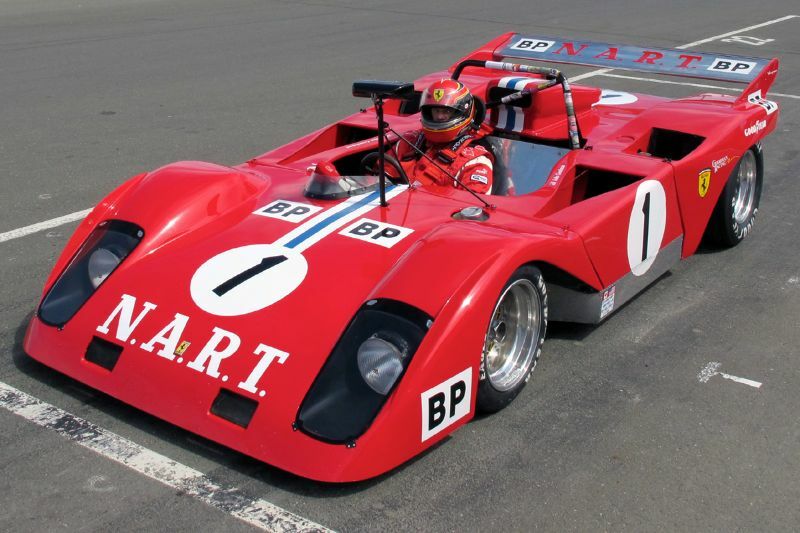 The total red package weighs 2,025 pounds and carries with it period racing history at Le Mans, Daytona and Sebring. John Goodman in his Ferrari on the grid at Infineon Raceway. William Edgar Photo. During a barbequed ribs and killer mac-‘n’-cheese lunch with salad side provided under the transporter awning by J&L, I asked John what his “other cars” might be. Well, there’s four Corvettes, a ’64 Cobra, a 512 BBLM and a 308 Ferrari GTB, this one here, plus a Ferrari 312 Formula 1 car. I might have missed a few. I know I did. “This is a good warm-up event for the other races coming this year,” said John, who really lights the scene wherever it may be. He’s totally energized, like his race cars. “This is a good track,” he went on, as all listened. “Good people! Good food! And now that Louie has the food down pat I just come here to eat!” And to drive, to drive. The rich are different from us. Wealthy or not, I personally thank the owners of such cars for sharing them with us. Where else are we able to literally touch the best of the best of anything other than at the vintage car events? Try touching your favorite painting at the local museum…and I could go on. Great piece Mr Edgar. Real enjoyable to get in the cockpit with these three owners. Really nice article Mr. Edgar. It’s always great to get a behind the scenes look at these great people and the wonderful cars they pull out to “exercise” every so often. Great article and photographs. The Lotus and Devin were great and the MG just jumped off the screen. Well done that I will surely keep. Thank you. I love the stories, I have a Devin SS in my shop and the interior shot of the SS shows some side protection bars in the door. I would like to do that! Can you send along that photo for me to show my client? Safety is good even if not period, we know more now. Excellent article, great to see that Will Edgar is writing for SCD. The style of Mr. Edgars’s race report is the best I’ve read in the vintage race genre. When reading it I felt I was part of each of the three teams, sharing the problems and anticpating the results. I was riveted! Much better than most race reports where only a few of the more interesting cars are described and the race results are pretty meaningless. 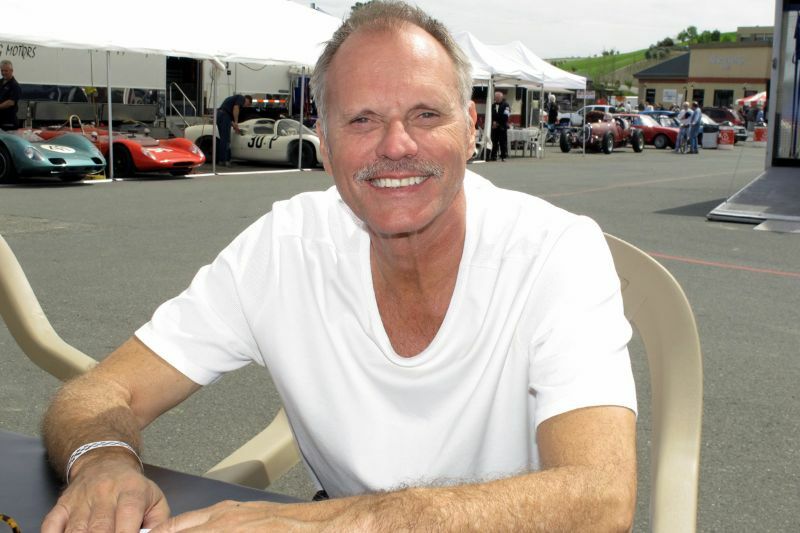 William Edgar, motorsport author/photographer and son of sports car legend John Edgar, has contributed articles to Bimmer, Corvette, Excellence, Forza, Octane and Vintage Motorsport among others. He co-authored (with Michael T. Lynch and Ron Parravano) the Dean Batchelor Award-winning book “American Sports Car Racing in the 1950s” and has received Gold Medallion International Automotive Media Awards for profiles on Bill Krause and Pete Lovely. In addition, his Edgar Motorsport Archive is a frequent provider of period photos for hardcopy and online publications.